First Time Home Buyers, Cave Creek, Carefree, Scottsdale, Phoenix, New River, Anthem and surrounding cities. You may be considered a first time home buyer if you have not owned any property in the last 3 years? We have a lot of information for the first time home buyer and it may be overwhelming at first. We are here to help. Please check out the links for additional information and if you have any questions, please don't hesitate to call our office 480-252-8300 or email us using the form at the bottom of this page. You can also sign up for email alerts to find your Dream Home. Click on the link below to get started now! Dreaming of home ownership? Here are 8 benefits of buying a home. They range from personal to financial. It is YOURS! - You can paint the walls any color you want, get pets, plant a garden, and create an outdoor oasis, build a patio or even a BBQ. You can create a home that meets your needs and tastes. Fixed Housing Payment - A 30 year fixed-rate mortgage locks in your monthly payment for 30 years. You know rent will keep increasing. Sense of Community – Home ownership gives you a sense of pride and makes you feel more connected to the community and neighborhood. Stability – You can stay in your home as long as you want and avoid cancelled leases. Credit – On time mortgage payments substantially raises your credit score. Increase in Value – Homes are an investment, yes, home values are rising again. In fact, home values have risen on average 5-6% in the past 50 years. Forced Savings – Your mortgage payments are increasing the amount of equity you have in your home and decreasing the amount you owe. The principal portion of your mortgage payments will grow your assets. Tax write-off – Well, at least at the time of publication, there are tax advantages of owning a home. Deduct mortgage interest rates and real estate property taxes on your income tax returns. See your tax advisor for all up-to-date details. Learn about down payment and closing cost assistance programs for the Phoenix area. Mortgage resources, calculators and tools to help you have a successful real estate transaction. A helpful checklist to help you decide what your next home should be. 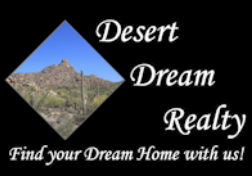 WHY TO SELECT DESERT DREAM REALTY TO REPRESENT YOU WHEN BUYING YOUR HOME.